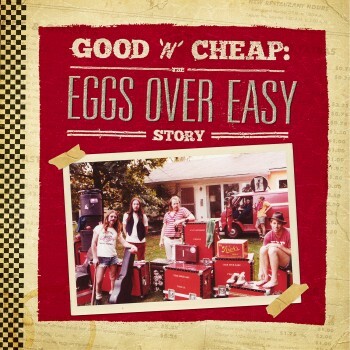 Eggs Over Easy, the criminally overlooked American band that invented pub rock, influenced the careers of artists on both sides of the Atlantic — from Nick Lowe and Elvis Costello, to Loudon Wainwright III and Huey Lewis — and laid the groundwork for a grass-roots movement that would spawn UK punk, is finally getting its due with Good ‘n’ Cheap: The Eggs Over Easy Story, a definitive 3xLP/2xCD set to be released June 24 via Yep Roc. Additionally, founding band members Jack O’Hara and Austin de Lone will play a special reunion show at NYC’s Rockwood Stage 3 on June 6. For the first time ever, the entire Eggs Over Easy catalog, lovingly restored and remastered, is available as a deluxe set. Included in this collection is the band’s debut album Good ‘n’ Cheap, produced by Link Wray and originally released on A&M Records in 1972; their rarely-heard second LP, Fear of Frying, originally (if barely) released on Lee Michaels’ Squish Records in 1980; two songs from the band’s lone single released on Buffalo Records; and the previously unreleased London ’71 sessions recorded at Olympic Studios, and produced by Animals bassist and Jimi Hendrix producer Chas Chandler. The 2xCD package includes a 24-page booklet, and the 3xLP set features an 8-page insert, with extremely rare photos, show flyers, press clippings, musician and writer credits, plus the definitive story of the band by acclaimed music writer Gene Sculatti, who called Good ‘n’ Cheap a “near-masterpiece” when he originally reviewed it for Creem Magazine in 1972. Which is how Eggs Over Easy leapt onto the pages of pop music history. Their humble Monday night gigs at a former Kentish Town jazz club called the Tally Ho – pub rock ground zero – would become the hub for a new network of artists, venues, and music biz makers and herald a sea change in the direction of underground and eventually popular music. New Nick Lowe and Los Straitjackets to release in June! Pre-Order NOW!